These 1.2 mil garbage bags feature super-duty capacity for loads of sharp objects, appropriate for the heaviest clean-up jobs around your facility grounds, cafeterias, warehouses and more. Boardwalk low density garbage bags have star sealed bottoms which conform easily to the shape of the garbage can and can handle 30% more load than standard sealed bags. 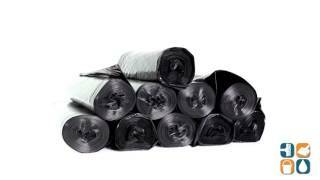 These black plastic garbage bags are packaged in coreless rolls to help reduce waste and are perforated for easy dispensing. An economical commercial garbage bag for the home, office, school or house of worship, Boardwalk Low Density Garbage Bags meet government guidelines for recycled garbage can liners. Stock up today and save! I use them for lawn waste. I would recommend them to anyone who needs a solid lawn waste or trash bag. For construction waste, I would go with a 2mil bag.